Pretty amazing isn't it? I'm so excited to have this new light for my workspace. I bought my new Ott lite at Michaels on sale for 50% off. Now I'm more confident that no matter what time of the day I'm stitching in, I'll be colour matching with greater accuracy and I should also be able to take better photos of the finished projects. Now that's something to cheer about! we've had computer troubles lately (to explain my most recent disappearance here) and a few project finishes. It's not like I can brag about my finishes as it seems that my gift making list continues to grow, so I need to pick up the pace to get it all done! 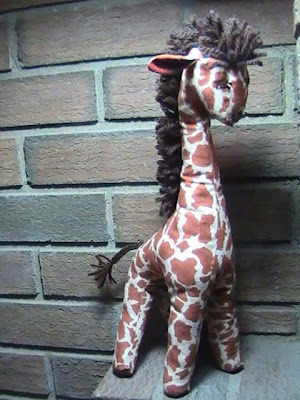 This stuffie is part of a baby gift I can almost cross off my list. Through my years sewing I've made up many different critters as stuffies, but this is the first giraffe I've tackled. 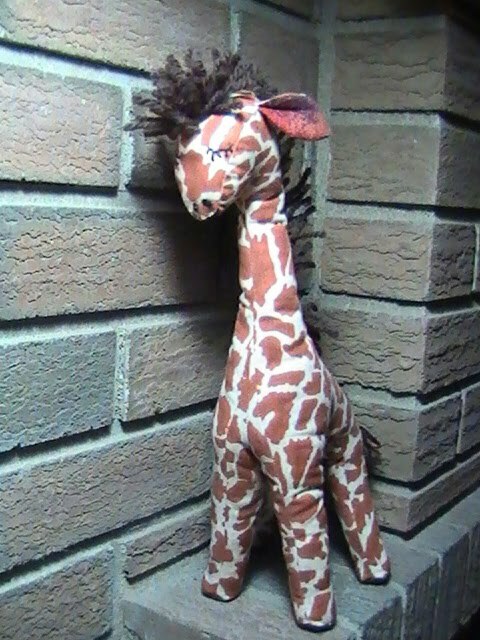 It was the fabric that first had me thinking about making a giraffe. 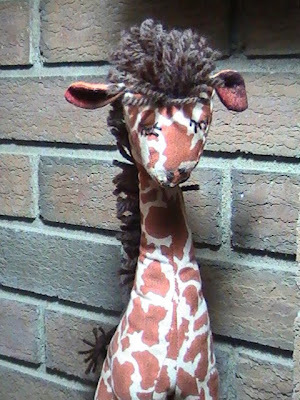 Then I happened upon a vintage pattern to make this lovely fellow, but I have to admit, I'm not so keen to make another like him. At least not without making some pattern adjustments to make the process easier. I've sewn lots of stuffies through the years including some in the miniature scale , but none were as tricky to sew as this guy. The most fun in making this? The mane and the tail! I didn't appreciate the "y" seams (due to the small scale), the itty-bitty circles for the hooves or the "too many" pieces that comprise the underbelly. I figured it all out - but it wasn't quick and it wasn't easy. This perfectionist did her fair share of slow stitching, a bit of picking out stitches and even resorted to hand basting pieces. Fun. This guy is just proof that I'm willing to try sewing just about anything. Once. He's done. Enough said. 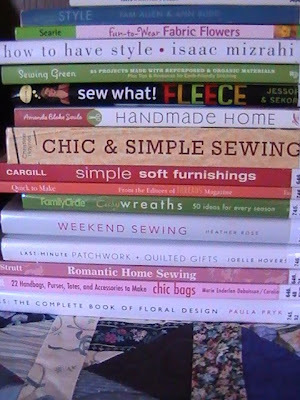 This is my latest stack of inspiration from the library. Some titles are new to me and some are like old friends. It doesn't matter how busy life gets around here, I always have wonderful books on hand, like these. That way, when I don't have time to do any creating of my own, I can enjoy seeing what others have made. I can't tell you how thankful I am for good books. Where do you go for inspiration or for a "creattive fix" ? 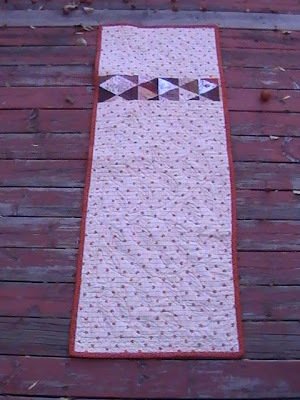 is my (tongue twister) name for the scrappy patchwork table runner I just completed. Autumn colours and pumpkin pie go hand in hand, right? 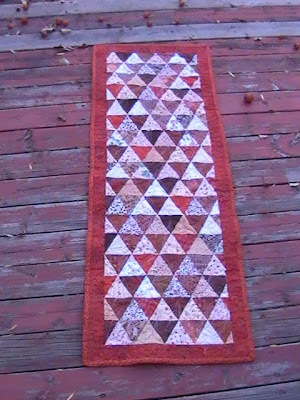 ;o) This table runner was inspired by the first project I've made piecing nothing but triangles together. 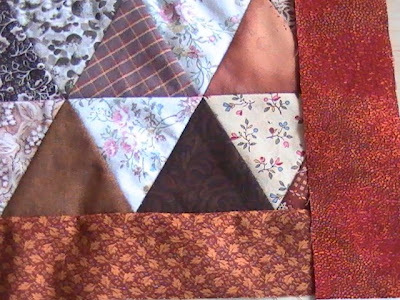 The trick to piecing triangles smoothly is in the pressing of the seams. 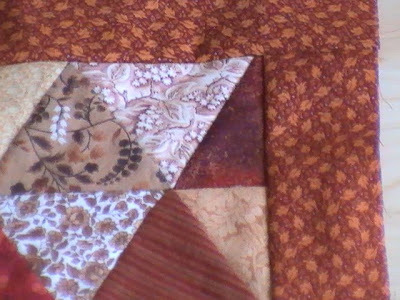 I'm happy with my decision to change the border fabric as it seems to compliment the triangles without blending in. 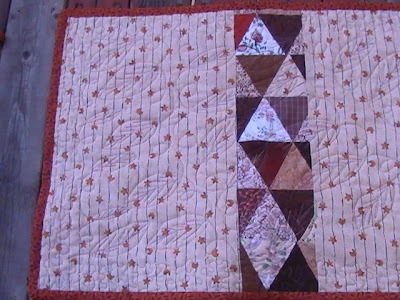 For a bit of whimsy, I free motion quilted a leaf pattern onto the triangles and then stipple quilted the border fabric. 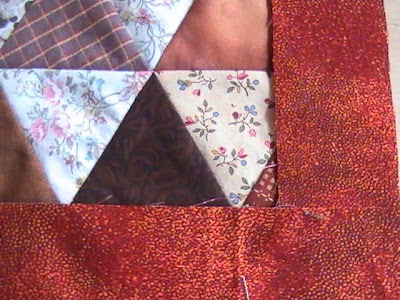 Finding that the fabric I wanted for the backing wasn't large enough, I decided to use leftover patchwork from the front to make up the difference. I now love the backing as much as the front! 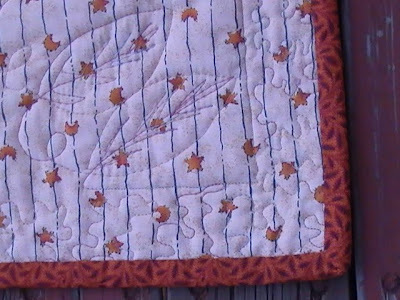 The backing also shows off my quilting more noticeably. 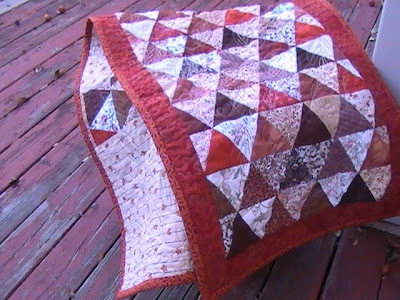 It is so liberating to free motion quilt. finished and ready to be enjoyed! I seem to be falling behind when it comes to finishing projects, sometimes because I change my mind midway into a project. 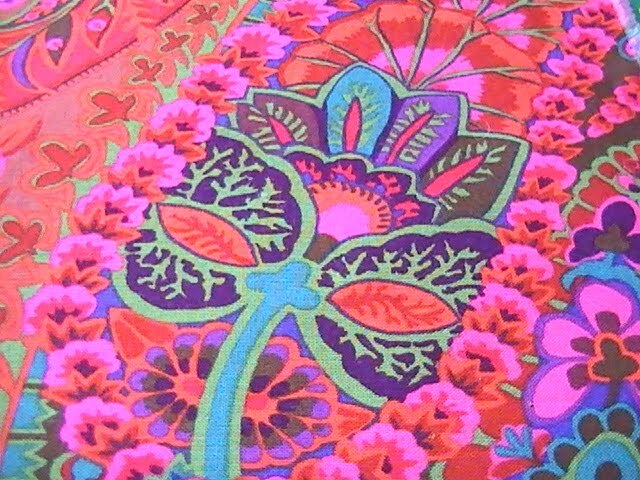 You know how it is, you think that certain fabrics are going to look great together and then... well, you think, maybe not. Here's my latest case in point. 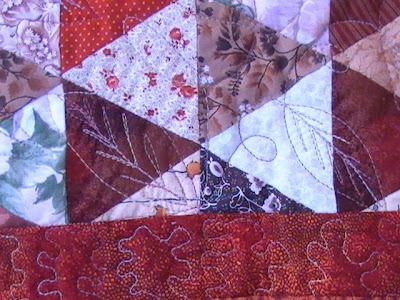 The leafy print border on this patchwork project just falls flat somehow. 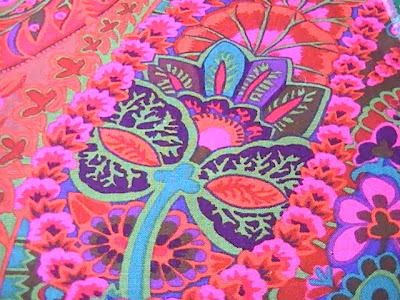 It didn't add the right amount of "zip", so I'm thinking I will change it out for this fabric border instead. Do you see what I'm seeing? 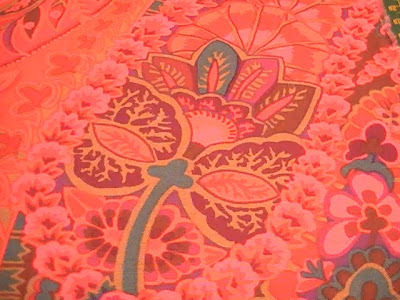 Doesn't the brighter strip on the right look more lively with the patchwork as compared to my first choice ( the leafy print strip on the bottom)? I'm breaking out the seam ripper to redo things. Here's to faster finishes - despite me changing my mind!